It is a beautiful, spring, Saturday morning and the sun is beaming its life-awakening warmth on the reviving earth below. The sunshine calls me outside for my morning walk where a surprising abundance of springtime memories await. The first of these calls to me from what may seem the most unlikely of places; the roadside ditches. Little streams of water flow in those ditches, and they immediately carry me back to the 3rd concession of Eastnor Township in Bruce County. I am, once again, walking that 1 ¼ mile gravel road home from school, and watching with fascination the ditches alive with the spring run-off caused by melted snow. I must stop to look. I hear the sound of the small rivulets of water as they flow steadily along, creating gurgling rapids as they go. The water runs from this ditch to a larger one, and eventually makes its was to Lake Huron just a few miles distant. I marvel at how clear and clean the water is as it washes over last year’s grass and the earth below, and I wonder again how that is possible. It was an earlier time, before words such as pollution had become part of our usual lexicon or our daily worries. I recall being so tempted by these cold, clear streams that I would bend down and scoop up water in my hands to drink. It was my own private sacrament. Water never tasted sweeter. Back from that brief reverie, I continue my walk and soon recall another stream. This one is a little larger and runs through the country property of a friend. When I first noticed it, I recall asking if there were any fish in that stream. “No,” my friend replies, “there used to be lots of them, and all different kinds, but that was before a local farmer spilled some fertilizer and killed them all. Now they are all gone.” I am shocked and saddened. I return to my walk. I see a coke can in the ditch, obviously thrown out the window of some passing car, and am surprised that people still do that. I think of the wise counsel we now refer to as Doctrine and Covenants 163, and of verse 2b in particular. I need to restore a healthy relationship with the earth; we all do. The little stream in the ditch beside the road reminds me. It is a restoring moment. If sacraments can be defined as sacred moments, then not all sacraments occur in church. May you be aware of your sacred moments in the streams of your life today. What wonderful thoughts Carman! As you now the Barrie Community of Christ group doesn't have a church, so all our sacraments occur outside. Maybe I need to consider how to celebrate these sacraments more fully. As you also know, we hold a monthly get together here named Streams. Its a warm welcome to explore Faith and Community of Christ with a group. I think I share your post with this group next time we meet. 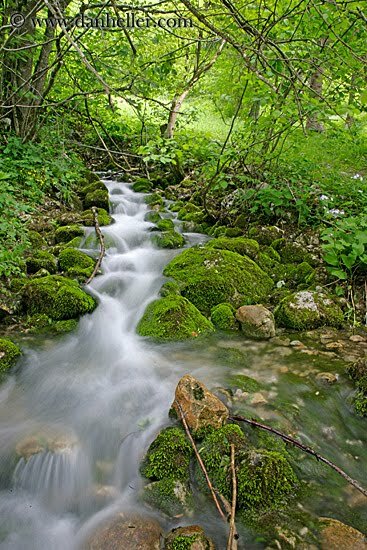 As for me, I remember exploring streams to see where they could lead me when I was a child. Later on I found a series of dried out streams to race my dirt bike along. Sadly,nowadays, it seems as though I stick to the man-made roads.